Microwave ovens are now used for more than just heating food or boiling water by only home users. 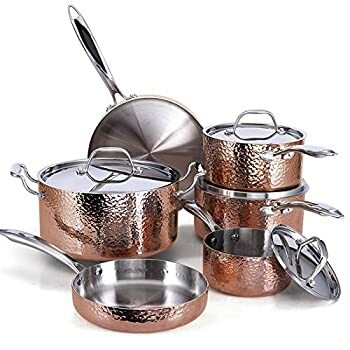 Chefs use them; they are located in convenience stores; gas stations; office break rooms; school and college dorms; and renters at apartments and condos. RVs, and semi-trucks use them with an inverter. Baked goods, pastries, pizza, popcorn, entire meals, defrosting, and more are done today in a microwave. A regular oven takes about an hour to bake a potato when it bakes under 10-minutes in a microwave saving power costs. 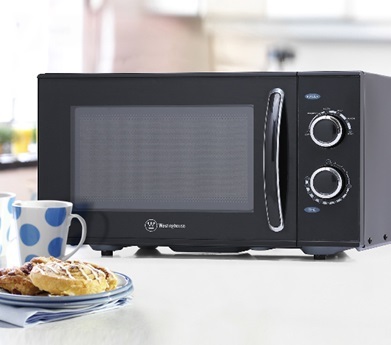 A new and very best countertop microwave is compact and portable to take with you when leaving an apartment or college door room. When replacing an old microwave or one that has broken, you will appreciate the features so convenient in the new ones. Many have locks to keep the little ones out, many levels of power, customized cooking menus on the control panel, programmable defrosting, warming up leftovers, a clock, and a timer setting. The designs are as sleek as a Corvette car that are available in stainless steel, black, white, and retro fun colors to harmonize with your kitchen décor. They are large inside with a glass turntable and easy-to-open handles. Some models will turn off the beep tone if you don’t want to hear it using the buzzer mute button or the method listed in the User’s Manual. The more wattage a microwave has, the more power for cooking in shorter times. For less space, compact countertop microwaves might just be for you, or for a larger family, you might want an extra-large unit for over the range, that are not reviewed here. Press a specific preprogrammed button that shows pizza, baked potatoes, popcorn, hotdogs, and others. Buttons are shown for reheating, defrosting, and more. Menu buttons let you do multiple functions. For example, if you want to make a bowl of oatmeal, first add cold water to a bowl, put into the microwave and push 3 for 3-minutes to get it to boiling. After it shuts off, open the door and add the oats, and close the door. Push 7 for 7-minutes then push 4 for the power level, meaning 40% power, so that it doesn’t boil over and when it’s finished, the beep sound will tell you to open the door and take it out. My microwave reviews below show #5 to be well adapted for seniors and those in wheelchairs with rotary knobs. Most of today’s microwaves have at least 10 levels of power from which to choose other than high, which is 100% power. These levels let you simmer, cook at a medium high rate and others. 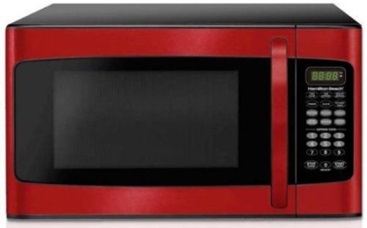 Read my microwave oven reviews here to find the best brand, wattage, cubic-foot sizes, and functions for your needs. Microwave ovens are not Energy Star® rated since they use such little power. If you want to make toast, microwaves will not do that. Get yourself a toaster oven for brown toast. The microwaves reviewed here are not convection ovens. 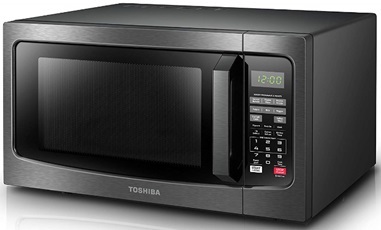 The Toshiba, model EM131A5C-BS, is the #1 best-selling microwave on Amazon in either black or stainless-steel, which is a few dollars more. 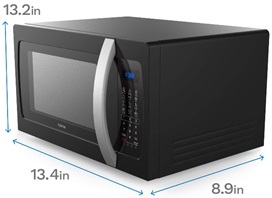 This is the perfect choice for home kitchens, office lunch rooms, apartments, condos, and school dorm rooms being one of the best microwave ovens on the market. It has the popular foods preprogrammed buttons for baked potatoes, pizza, vegetables, and more. The timer is useful for many timing functions with 10 power settings and a clock. It has 2 defrost settings: one is custom that you set and the other is for a 1-pound meat defrost. The glass turntable is 12.4-inches diameter for dinner plates. The large digital display is easy to see and read. It also has a buzzer mute function. For me, I would not turn that off, since I’d forget I had something in it. Your User’s Manual will show you to push the number 8 button for 3- to 5-seconds to turn the beep off. Cleaning is easy to do inside and out. The light inside stays on until your food is cooked. After you remove your food and close the door, it goes out. When you are facing the microwave, the vent is on the right side of the back of the microwave and on the left side of the microwave. One is the air inlet and the other is the air outlet. The digital control panel is not backlit. This is not a convection oven and does not mount above your cook stove. The black or stainless-steel oven’s outside is 20.5-inches wide x 17.1-inches deep x 12.8-inches high so you can measure your countertop for fit. The inside is 13.07-inches wide x 15-deep x 9.5 inches high. The output is 1100-Watts and the input power is 1550-Watts. The output wattage determines the power for fast cooking. Plug the UL® listed 36-inch 3-prong grounded cord into a North American 110/120-Volt, 50/60-Hz outlet. It is not 220-Volts. The Amps are 13. Don’t forget to remove the protective film covering by grabbing an edge with your nail then pull to peel it off. You will receive a User’s Manual and a 1-year Limited Warranty on the unit and magnetron. Toshiba EM131A5C-BS Microwave Oven review video – the best bang for your buck, I think. The Panasonic®, model NN-SN736B comes in black or white and is also available in 2.2 cubic feet if you need a larger inside capacity for your family. The housing is metal and the keypad is plastic. Don’t see a handle to open the door? It’s not there; to open, simply press the white button below the numbers for this to be one of the best countertop microwaves. The glass turntable is 15-inches diameter. The Inverter power means it uses less space for electronics so that you have more space inside. 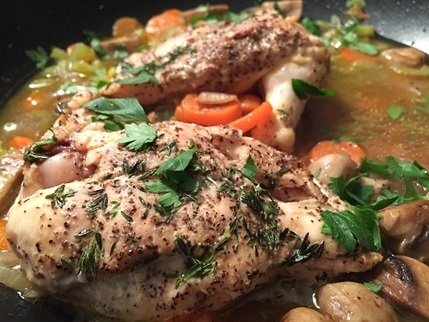 This allows delicate foods to simmer without overcooking. In addition, foods retain more color, texture and nutrients for fast, easy, and delicious results. There are 13 preprogrammed automatic menu items, automatic cook, a delay start function, more/less control, quick program, and popcorn button. The keypad also has 5 menu buttons for you to program your most often cooked food items. It has 10 power levels to cook at a specific percent of power that is most useful. The inside capacity is 1.6-cubic feet with great power for quick cooking at 1250-Watts. Poach, braise and steam to perfection using this durable microwave. The beeping system can be turned off through the setup menu. See your User’s Manual on the Operations page 8 #3 to do this function. The light comes on when you open the door and stays on while food is cooking. A child lock is on the unit. See the User’s Manual to press the Start button 3 times to lock the keypad, then press Stop 3 times to unlock it. If you have a Wi-Fi nearby and it turns off your microwave know that microwaves run at 2.5 GHz, the same frequency as a basic Wi-Fi. Get yourself a dual band Wi-Fi router that runs at 2.5 GHz and at 5 GHz and switch your Wi-Fi in your laptop, desktop, or phone over to the 5 GHz band. That’s the only way to solve your problem or move your device farther away. You can’t change the microwave, so you’ll have to fix the problem through your Wi-Fi device. The inside dimensions are 9-inches high x 16-7/16-inches wide x 18-1/2-inches deep. The outside dimensions are 12-inches high x 19-7/16-inches wide x 21-7/8-inches deep front-to-back. Plug the UL® listed 44-inch 3-prong grounded cord into a North American 110/120-Volt, 50/60-Hz outlet. It is not 220-Volts. The Amps are 12.3. You will receive a User’s Manual and a parts and labor Warranty of 1-year with the magnetron Warranty for 5-years with its labor of 1-year. Panasonic NN SN936B Microwave with Inverter Technology video. If you don’t have the Alexa device, it’s available on Amazon here. You need to know that an Echo device is not included and is required to use the voice control features and quick-cook voice presets. Alexa is always getting smarter and adding new presets. You can buy the microwave without Echo but the best way to buy is bundling the Echo Dot® (3rd generation) for only about $49 more. 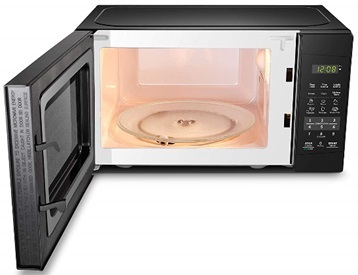 As with all microwaves, preset performance depends on a number of factors and may vary. Learn more on Amazon. The microwave will still work if the Internet is down. The Wi-Fi connectivity is 2.4 GHz only, 802.11 b/g/n. 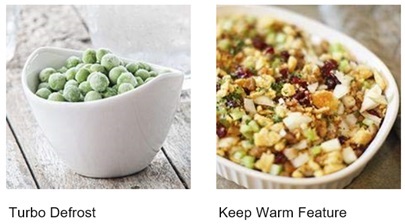 It’s easy to defrost vegetables or simply cook the frozen ones. You will be able to make popcorn, potatoes, reheat rice and other foods. With an Echo device (not included), quick-cook voice presets and a simplified keypad let you just ask Alexa® to start microwaving. The small compact size lets you have more counter space. The unit has 10 power levels, a clock, timer, 10-inch turntable, and child lock. The external measurements are 17.3-inches wide x 10.1-inches high x 14.1-inches deep. It weighs 21.9-pounds. The inside measurements are 10.75-inches wide x 6.75-inches high x 11.5-inches deep. Plug the UL® listed 24-inch 3-prong grounded cord into a North American 110/120-Volt, 50/60-Hz outlet. It is not 220-Volts. The Amps are 5.8. You will receive a User’s Manual, Echo Dot® if you bought it with the unit, and a 1-year Warranty with service included. 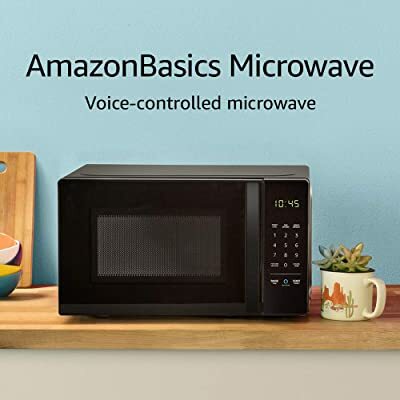 AmazonBasics voice activated microwave video. 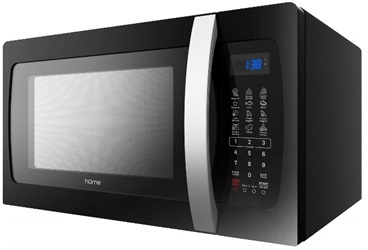 The hOme® countertop best portable microwave, model EM134AJ3 is available from Amazon in black only with a matt finish and stainless-steel handle with one-touch cook functions and 10 adjustable power settings holding 6-quarts. The rotating 12.4-inch diameter glass turntable is dishwasher safe, but hand washing is recommended. Ideal for small kitchens, apartments, and school dorms, this being portable can be taken with you when you leave. Use the quick touch button for making pizza and popcorn. It will hold a frozen 11-inch grocery store pizza with no problem. 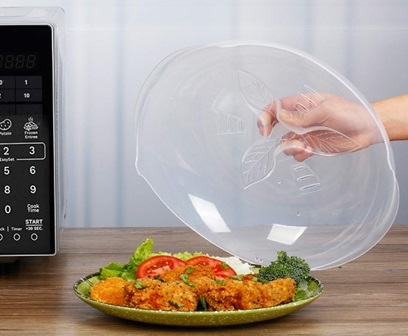 With 11 cooking functions, 7 preprogrammed functions, and 10 power levels there’s not much you cannot do with this countertop compact portable microwave. 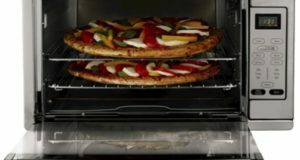 If you want your pizza crust crisp, put it in your oven on the top rack and turn the broiler on for a few minutes while you watch it. Steam your vegetables, defrost meat, and poultry with the defrost options by time or weight. A speedy quick heat button lets you heat anything fast. The child lock is good to have for small kids to keep them out. The instructions tell you how to set it with the buttons. You will have a Memory feature for your favorites. This microwave cannot have the beep sound silenced. The inside lights up when cooking and opening the door and the LED light display is modern and stylish. The outside measures 13.2-inches high x 13.4-inches wide- x 8.9-inches deep and it weighs 40-pounds. The inside measures 20.4-inches wide x 14.6-inches high x 11.5-inches deep. Plug the UL® listed 43-inch 3-prong grounded cord into a North American 110/120-Volt, 50/60-Hz outlet. It is not 220-Volts. The Amps are 12.6. You will receive a User’s Manual with full instructions and a Warranty. hOme®Labs 1050-Watt Countertop Microwave Oven video. Westinghouse® is a trusted name for appliances and the very best microwave brand. 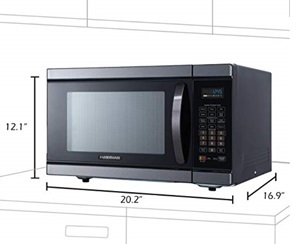 This model WCMH900B microwave is black and is also available in 0.6 cubic-feet for a smaller family or single person with limited kitchen space. It’s also ideal for lunch breakrooms, dorm rooms, apartments, RVs, and trucks. What makes this a rotary unit is that the controls are round knobs rather than push buttons. Many people like this functionality better because it’s so simple. It’s convenient for seniors, those with arthritis, the sight impaired, and people in wheelchairs. The output power of 900-Watts will warm foods, beverages, snacks, melt butter and chocolate for baking, and prepare food for dinner. It has a 10.5-inch glass turntable. The handle is the grasp pull type for opening the door then push it shut. 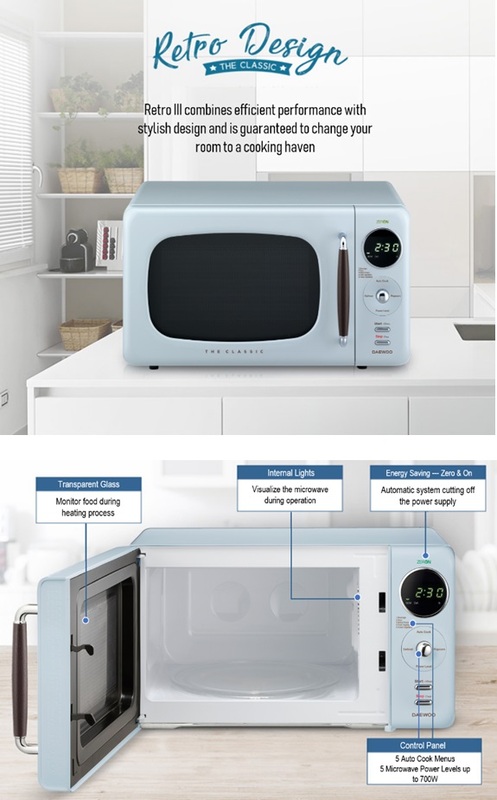 It has a cooking time range from 1- to 30-minutes turning the dial knob and 6-power settings of defrost, medium low, medium, medium high, and high. The dial is listed in 1-minute increments and does not do seconds. If you want 20-seconds to warm coffee, set to 1-minute, count to 20, and open the door. It will defrost, bake a chicken, bake potatoes, make popcorn and do everything a microwave with pushbutton controls can do. It does not have a child lockout, mute sound function, or a clock. The outside measures 19-inches wide x 14.25-deep x 11.1-inches high and it weighs 23.1-pounds. Plug the UL® listed 3-foot 3-prong grounded cord into a North American 110/120-Volt, 50/60-Hz outlet. It is not 220-Volts. The Amps are 10.8. Gift-wrapping is available and you will receive the User’s Manual with a 1-year Warranty on parts and labor with the magnetron tube (part only) for 5-years. 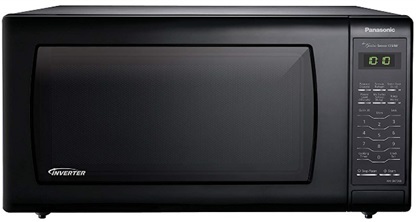 The Farberware® countertop microwave, model number FMO11AHTBSJ comes in black with stainless-steel trim and handle with smart sensor cooking. 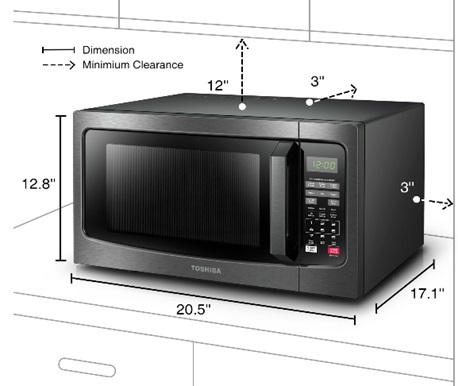 It’s also available in 1.2, 1.3-, and 1.6-cubic-feet for your needs as one of the best medium-size microwaves around. The unit fits neatly on your countertop and is perfect for warming a bowl of soup, a few slices of pizza, or a casserole for two. For a big family or a serious foodie, the largest capacity, 1.6 cubic feet, offers immense flexibility. Check it out on Amazon. It will complement your kitchen with its good looks and provides you not only with style and the 1100-Watts output power. It is lit with LED lights inside and they remain on while food cooks or reheats. This unit has blue LED lights for the panel display and other microwaves do not have that light feature. The control panel is not backlit. The smart sensors monitor the temperature and amount of steam from the food. It knows to watch for how much water remains and how long it needs to keep heating. It has 6 one-touch cooking programs, frozen pizza button, with buttons for reheating, frozen veggies, potatoes, popcorn, and meat. It will melt and soften butter for baking and has 3 preprogrammed cooking menus with one for stew. Inverter precision cooking technology produces even temperatures, consistent textures and prevents overcooking and loss of nutrients. Your food can be prepared to perfection with minimal hot spots and burn risks. Inverter defrost allows you to defrost foods such as meat, poultry, and seafood simply by entering the weight, while preventing cooked edges. The multi-stage cooking is not on all microwaves and this top best microwave has it. It’s very convenient. What that does for you is it adjusts the cooking level in the middle of the cycle allowing for a perfectly finished food dish. Other features are a Memory function for customized settings that you create. There is a 1- to 3-minute express cook plus 30-seconds control button. With 10 power levels, child safety lock, 12.4-inch glass turntable, and ECO mode, this unit is sure to delight all of your whims for the perfect microwave. The exterior dimensions are 20.2-inches wide x 16.9-inches deep x 12.1-inches high. The interior cavity dimensions are 14.49-inches wide x 13.9-inches deep x 9.09-inches high. Plug the UL® listed 24-inch 3-prong grounded cord into a North American 110/120-Volt, 50/60-Hz outlet. It is not 220-Volts. The Amps are 13.2. You will receive the User’s Manual and a 1-year Limited Warranty. The Kenmore® brand has been around for more than 100 years and is a trusted brand. It was always sold for decades at Sears®, but with declining sales now using the Internet and other technology for buying, it is available on Amazon. People, like myself, love the Kenmore® brand! Since there are fewer Sears® stores, we can still purchase our beloved brand on Amazon including this very best countertop microwave oven. 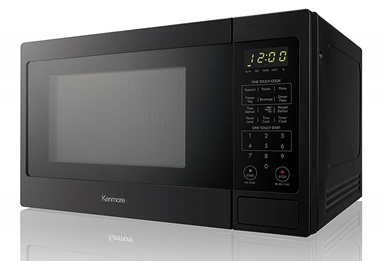 The model number 70919 is available in black or stainless-steel in 0.9 and 0.7 cubic-feet and Kenmore® is the best small microwave. The interior light comes on when you open the door and stays on while the food is cooking. 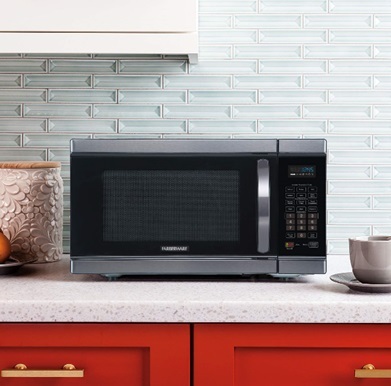 Heat all your favorite snacks and meals inside this Kenmore® countertop microwave. Perfect for your studio kitchen, dorm room, office lunch rooms, or shared living space, it can be taken with you when you leave. This compact microwave won’t take up a lot of counter space. It has multiple one-touch cooking functions, and will perfectly pop popcorn, heat soup, and pizza without all the guesswork. It has 6 automatic preprogrammed cooking functions for many dishes, popcorn, pizza, potatoes, veggies, and more. When you add 30-seconds, that function quickly heats or puts the finishing touch on your food. You can automatically defrost meats and more either by time or by the weight with a beeping reminder to turn it over. The glass plate on the turntable is 11.2-inches and recessed to make it easier for you to put food in and out. The child safety lock prevents accidental opening by your youngster. It has a digital clock and timer that work separately; you cannot use the timer while cooking your food because it is counting down your time. You can cook using the timer up to 99-minutes—about an hour and a half. The outside dimensions are 18.3-inches wide x 11.02-inches high x 14.49-inches deep. The interior dimensions are 12.4-inches wide x 9.3-inches high x 13.6-inches deep. It weighs 25.8-pounds. Plug the UL® listed 2.62-foot 3-prong grounded cord into a North American 110/120-Volt, 50/60-Hz outlet. It is not 220-Volts. The Amps are 10.8. Kenmore® 70913 microwave oven video. The Comfee® is small for small spaces. 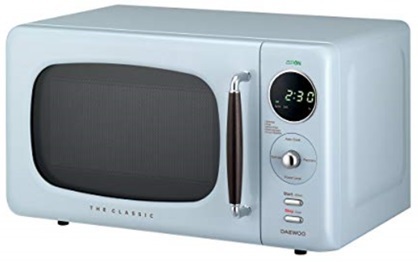 The model number EM720CPL-PMB is a very best microwave and has the feature for turning the beeping sound off using the quick and easy mute button or leaving it on. Available in black or pearl white, find the color you want on Amazon. You will love the express one-touch cooking for 1- to 6-minutes plus a 30-second button for 6 most common foods. It has 11 power settings, clock, and timer that function separately, and an ECO mode. Press the desired preprogrammed button and the microwave automatically starts. 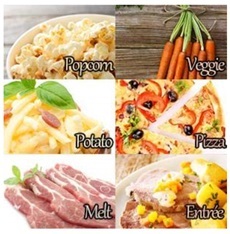 Easily make popcorn, baked potatoes, pizza, frozen vegetables, or reheat a beverage or dinner plate. The large LED light display is easy to read on the control panel. The inside light goes on when you open the door and stays on while your food is cooking. With a glass turntable, it is removable for washing. With a 10-inch diameter glass turntable, it is removable for washing. The outside measurements are 17.3-inches wide x 13-inches deep x 10.2-inches high to check for fitting your counter space. The inside measures 12.05-inches wide x 11.97-inches deep x 8.11-inches high. It weighs 20.2-pounds. Plug the UL® listed 3-prong grounded cord into a North American 110/120-Volt, 50/60-Hz outlet. It is not 220-Volts. The Amps are 8.4. You will receive a User’s Manual and a 1-year Limited Warranty. Comfee EM720CPL-PMB Countertop Microwave Oven video. The Hamilton Beach® model number EM031MZC-X2 in retro metallic red with black sides and top will go well in a kitchen, dorm room, break room, or apartment to harmonize with or complement your décor. 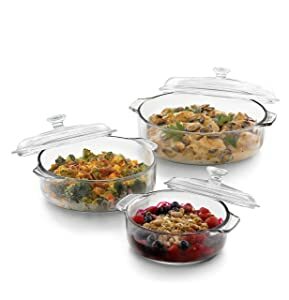 It is a best seller on Amazon and is inexpensive for a large microwave oven. The Hamilton Beach® logo is on the black part and cannot be seen in the picture. You will have 6 quick-set menu button and 10 power levels with LED display. The child lockout feature will keep your kids out. It has the kitchen timer and digital clock and they cannot work at the same time. It has a 30-second, 1-, 2-, and 3-minute buttons for quick heating of water for oatmeal and warming coffee at 30-seconds. It does not have a silent mode for the beep to be turned off. The glass turntable is 12-inches to hold a frozen 11-inch pizza on a cookware dinner plate. For your meat and poultry, you can defrost either using time or using the product’s weight. The dimensions are 20.20-inches long x 17.10-inches wide x 12.10 inches high and weighs 36-pounds. Plug the UL® listed 42-inch 3-prong grounded cord into a North American 110/120-Volt, 50/60-Hz outlet. It is not 220-Volts. The Amps are 12. You will receive a User’s Manual and Warranty. The Daewoo Classic, model KOR07R3ZEM on Amazon is a retro design with push button and a handle to pull the door open. This large microwave oven model adopted a design inspired by the 80s. It comes in many fun colors of city blue, cream, cream white, mint, red, and white. It is made of plastic that’s easy to clean and portable. The glass 10-inch turntable plate is concave, meaning recessed to get your food in and out easily with 5 power levels, 5 automatic cook menus, 2-way defrost of time and weight, child safety lock, and energy saving clock that goes out when not in use. It has an interior light and it’s only on when the unit is cooking and does not come on when the door is opened. The power cord is black located at the upper right rear corner. It has no clock settings and beeps each time the door is opened. The outside dimensions are 17.7-inches wide x 10.2-inches high x 12.8-inches deep. Adding the handle, the depth front-to-back is 14.50-inches. The inside dimensions are 12.1-inches wide x 8.3-inches high x 12-inches deep. Plug the UL® listed 33-inch 3-prong grounded cord into a North American 110/120-Volt, 50/60-Hz outlet. It is not 220-Volts. The Amps are 12. The input is 1100-Watts and the output is 700-Watts. You will receive the User’s Manual and a 30-day Warranty. Read your instruction manual to understand how your countertop microwave works. It’s important to know the amount of time it takes to cook specific foods and your User’s Manual will tell you. Plus, you will learn by trial and error. Different Watts and different brands for microwaves vary. A 700-Watt oven will not have the power of a 1200-Watt unit. Don’t know the Watts of your oven? Check the door panel on the housing on the left side on inside bottom frame edge. If it’s printed on the back, write it down on your User’s Manual to have at hand. Standing time is the time it takes for the food to rest. That’s the same as using a regular oven. It lets the food have time to blend the flavors improving the taste. Let the food rest inside the microwave for best results. When your plastic bottle of honey has turned to sugar, remove the sugar crystals by putting the bottle in the microwave for 30-seconds to a minute. Do this again if all the crystals have not dissolved. Be sure to open the lid or remove it. To clean your microwave, put a bowl of water inside and let it run for a few minutes then sit for the steam to do all the work. Remove the bowl and wipe clean. Glass turntables are best handwashed for not chipping in the dishwasher. 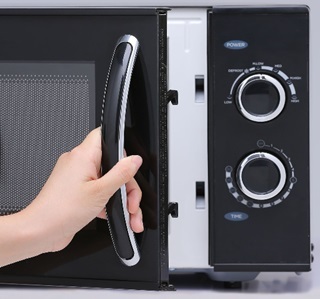 Never use scratchers, abrasives, or sharp knives in your microwave; it will damage the inside material its made of. Dishwashing detergent will work just fine. Never ever put metal or stainless-steel cookware inside a microwave. It will cause sparks and ruin your oven. It’s best to cover your food with a microwave plate cover for under $10, paper towel, or plastic wrap to avoid the mess to clean up in the first place. I know I love mine and it’s dishwasher safe on the top rack. Do you want to pasteurize your garden soil without using the power of a regular oven to heat your kitchen for potting soil? To kill the diseases in soil and prevent problems with your plants, simply fill a paper bag (not plastic) with soil and cook in your microwave oven that uses less energy than the big oven. Be sure the soil is moist; if not, add drops of water. The minimum temperature is 140-degrees for a half-hour. Your instructions will tell you the power level for temperatures. Remove the soil, let it cool in the paper bag, then pot your seeds or plants. I’ve had success with this using my own garden soil or commercial soil in bags. You will want to know the output wattage not the input wattage of your oven. 1000-Watts or more—water boils in less than 2-minutes. 800-Watts or more—water boils in 2-1/2-minutes. I have a 900-Watt microwave in a popular brand, and it takes 3-minutes to boil a cup or mug of water. Before grabbing a hot cup or hot plate, touch it; you might need to use a pot holder. 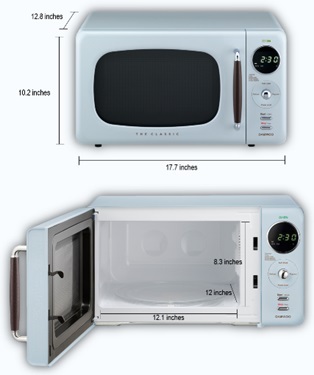 The best rated microwaves have been evaluated here for your convenience when shopping online. Amazon.com® offers the best prices, deals, and shipping options. Leave your questions and/or comments below and I will reply to each of you. Happy shopping!